As a member of the elite force T.I.M.E. Or Temporal Inevitability Manipulation Experts, you travel though different time periods correcting history’s horrible mistakes. 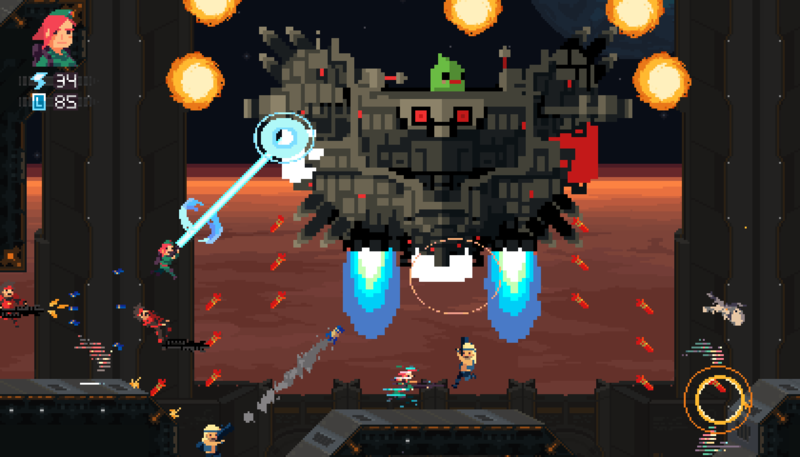 This is the basic premise of Super TIME Force. 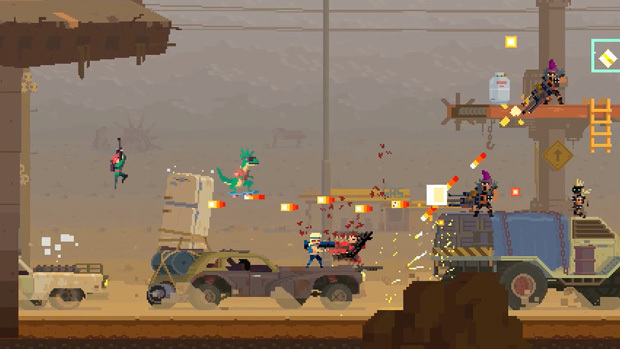 This is one crazy action-packed side scroller for sure, but is it any good? Let’s find out. Though the story may seem a bit simple, it is really a blast to play. It makes fun of itself quite often, and has some really great humor throughout. Honestly, it feels like an old-school Saturday morning cartoon, and this is a good thing. It never takes itself seriously, and you can just have fun with it. First off, the graphics look great for what they were going for, which is very retro. 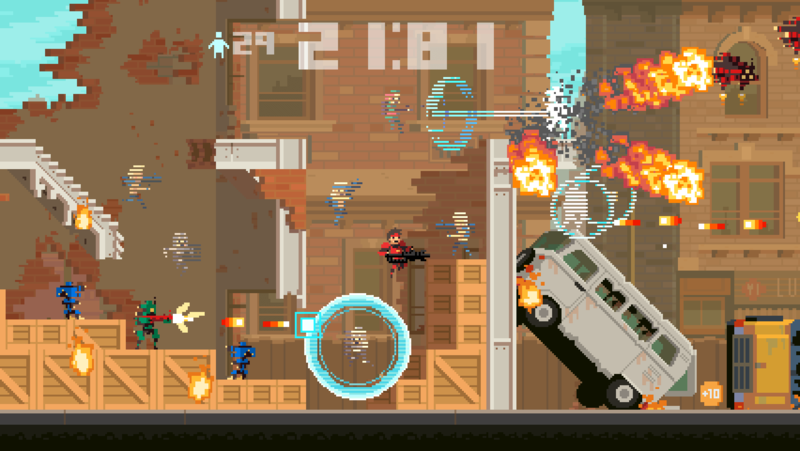 It’s like an HD version of your favorite NES shooter as a kid. Each stage is well represented, from the ruined city streets to the sci-fi-themed interiors. The enemy and character art is nicely done, as well. The bosses are crazy over-the-top, and all look great. The music is pretty much what you would expect. This is some great chip tune goodness right here. Each tune is catchy, and you will find yourself humming along as you are mercilessly slaughtered TIME and TIME again. It reminded me of my NES days. The sound effects, while all pretty standard, get the job done nicely. It’s still nice to hear retro-style laser blast and explosions everywhere. 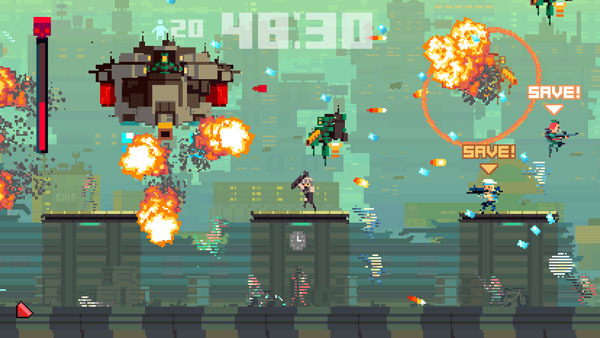 Now, the meat of Super TIME Force is the gameplay. At first glance, you will think “Hey, this looks like Contra,” but there is a lot more to it than that. First of all, you are given 30 lives to complete each stage. I know what you’re thinking — well that’s a lot, this should be no issue. Yeah, but you’d be wrong. On top of that, you are given only 60 seconds to complete the stage. Now, I hear you saying, “How is that even possible? !” When you can manipulate TIME, all things are possible. First off, you can rewind and fast forward TIME. This is done with a simple button press. When you die, you can rewind TIME and try for a better result. Here is where another interesting mechanic comes into play. You can switch characters or use the same character as you rewind TIME, but the actions taken by your previous embodiment will still be carried out. So, you can use several different strategies since each character has different weapons and skills. For example, after you rewind you choose the character with a shield and block off some of fire, or pile the past embodiments of yourself on top of each other for extra damage. There are many possibilities here. This mechanic is really fun once you get the hang of it, but it does have a slight learning curve. There are some tutorials to get you started here, as well. Each stage has a few hidden TIME Shards to give you some extra time, and there are some secret goodies, as well. There will be TIMES when you survive the stage only to find out you don’t have enough TIME left to beat the boss. This can be very frustrating, and I have to say the boss battles are well thought out and require a bit of strategy to complete. Another thing to note is that you will start off with three characters from which to choose, and you will have to save the others from death while progressing throughout the levels in order to use the rest. There are sixteen characters and six levels in total. Personally this was not my type of game. I’m not a huge fan of these retro style run-and-gun games. I died plenty enough playing Contra as kid. That being said, the TIME mechanics and humorous story still make this an enjoyable experience for most players. Though you can complete this game in around four to five hours, you will want to replay each stage for a better score on the leader boards and unlock all the achievements. So, if you if you looking for a nice bullethell game, don’t mind a challenge and love a goofy story for the 15-buck price tag, this one is definitely worth your TIME.